Perth-Wellington MP John Nater dropped by the Museum this week to meet our five summer students who are all here as part of federal student job programs. 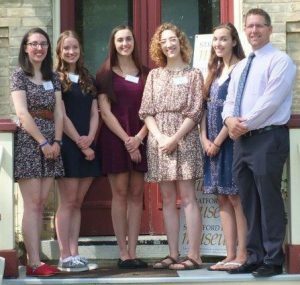 From left, Mary Coonan, Julia Ranney, Bailey Heimpel, Emma Thomas and Maddie Hendricks — and Mr. Nater. This Facebook post by our friends at Stratford Tourism Alliance has really taken off with almost 500 shares and even more likes. 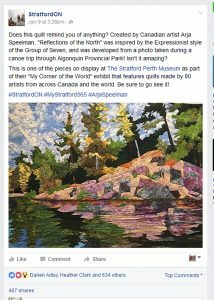 It is a great photo and depicts just one of the 81 amazing works of art currently at the Stratford Perth Museum as part of our My Corner of the World fabric art exhibit.